We had our first snowfall here in upstate NY, a whole 1-2 inches at best. Yet that was enough to send every driver into student driver mode. A drive that should have taken me 10 minutes, 15 minutes tops, took 50! FIFTY!!! 5-0!!! So frustrating but it got me back here so it wasn’t a complete waste. It wasn’t just the snow that slowed everyone down. I realized, as I was sitting on the same stretch of road for a majority of my FIFTY minute drive, that it’s the road that’s the problem. Sure they put in a round-about but that’s doesn’t address the real issue. Retail stores and other businesses are popping up down the strip but they haven’t made any adjustments to handle the amount of traffic that it’s generating. It’s great for the economy and all. Come to think of it, I bet the oil companies are somehow behind all this. I digress. The road has always been two lanes, it widens near the entrance to the highway but a majority of the road it two lanes. We need four lanes people! I don’t know how to fix this problem …I’m just throwing out the solution. No meal is complete without dessert …ok, maybe with the exception of breakfast but I’m not opposed to the idea. 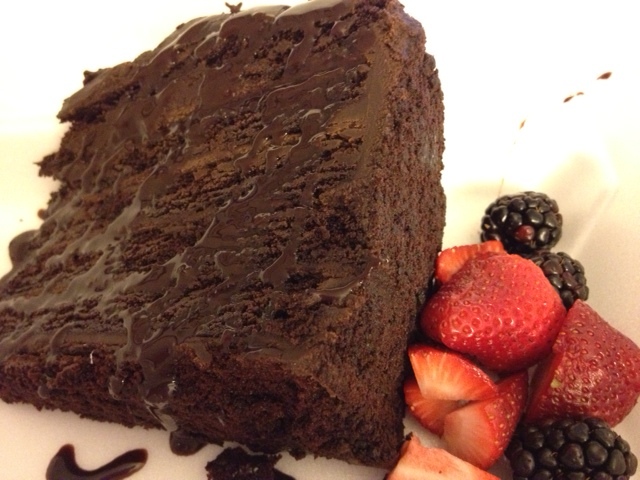 One evening I just wanted chocolate and was fortunate enough to stumble across a chocolate, chocolate cake on the hotel menu. How can you go wrong with chocolate cake, chocolate frosting, chocolate drizzle and fresh berries? You can’t! Not all dining experience are created equal (thank God!). 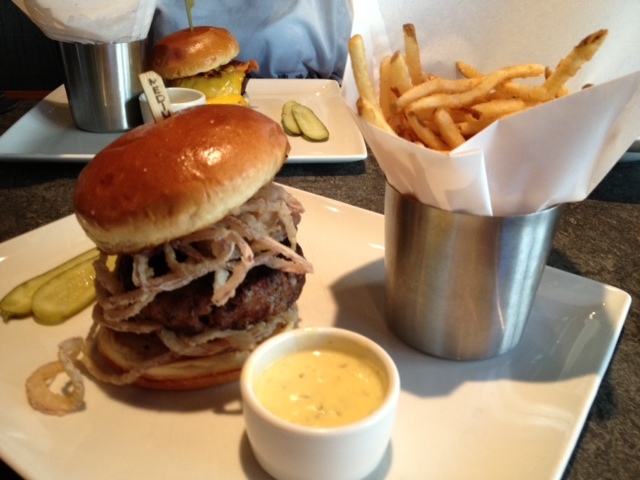 When visiting Southern California I make sure to have dinner at the Yard House. 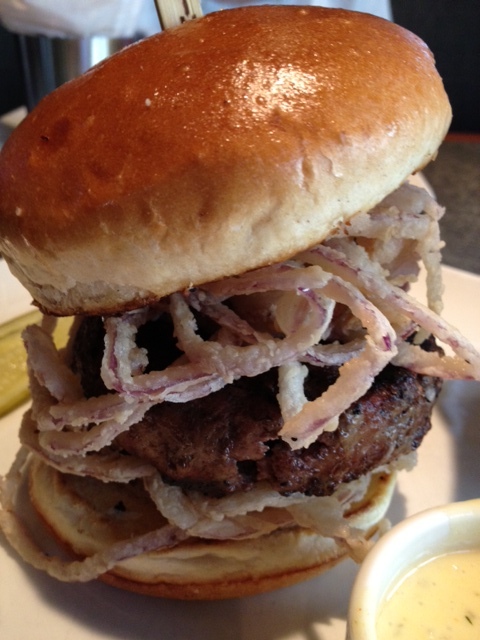 While known for its wide variety of draft beer, the food does not disappoint. I have to admit, I haven’t tried the beer (yet). There hasn’t been a meal that I haven’t enjoyed. On my last visit I decided on a burger. There were several to choose from and I narrowed it down between the Bearnaise – classic bearnaise sauce and fried onions and BBQ Bacon Cheddar – applewood smoked bacon, rum bbq sauce and roasted garlic aioli. The Bearnaise won. This evening I went to Bob and Ron’s Fish Fry for dinner only to find that they have changed their fries, onion rings and fish fry. 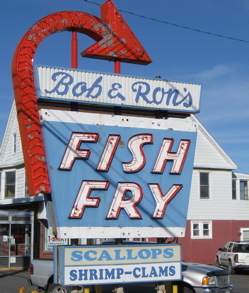 Bob and Ron’s has been serving the Capital District for well over 50 years. Ownership has changed over the years but the food always remained the same …until now. I’m not exactly sure why the food changed. I heard their fry machine broke but it’s a moot point. There are certain establishments that remain a staple over the years. People return to these places because they love the food, they have memories or a combination of both. When something changes it shifts the balance of the universe. Ok, that’s a bit much but it does have an impact on those who have been patrons for years. I happen to have fond memories of Bob and Ron’s growing up. My grandmother and mother had gone there for years, they brought me there, they brought my daughter and son there. This is how places like this survive generation after generation. Build it and they will come!! It can’t happen soon enough for me!! SARATOGA SPRINGS — Area officials caught a glimpse of Las Vegas-style gambling Thursday, when the owners of Saratoga Casino and Raceway announced plans for a $40 million expansion that would bring dice rolling and poker back to this old gaming city. Saratoga Harness Racing Inc. wants to add 15,000-square-feet to the casino/harness track for table games like blackjack, roulette and craps. The $40 million project also calls for a 130-room hotel, an event center, additional dining options and, possibly, a parking garage. I made the best purchase of the year! I know it’s early yet, only the 8th, but this is up there. 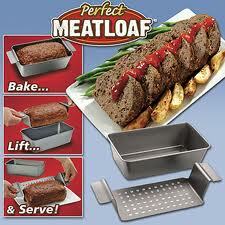 It’s the perfect meatloaf pan! It has a rack that allows the fat to drip to the bottom of the pan and you can easily lift it out of the pan. No fat drenched meatloaf, no struggle to get it out of the pan! Trust me …you need one! I got mine for $9.99 at The Christmas Tree Shop.